Say you're trying to pull off a design effect where the corner of an element are cut off. Maybe you're a Battlestar Galactica fan? Or maybe you just like the unusual effect of it, since it avoids looking like a typical rectangle. I suspect there are many ways to do it. Certainly, you could use multiple backgrounds to place images in the corners. You could just as well use a flexible SVG shape placed in the background. I bet there is also an exotic way to use gradients to pull it off. But, I like the idea of simply taking some scissors and clipping off the dang corners. We essentially can do just that thanks to clip-path. We can use the polygon() function, provide it a list of X and Y coordinates and clip away what is outside of them. Check out what happens if we list three points: middle top, bottom right, bottom left. That's OK, but notice how the notches aren't at perfect 45 degree angles. That's because the element itself isn't a square. That gets worse the less square the element is. We can use the calc() function to fix that. We'll use percentages when we have to, but just subtract from a percentage to get the position and angle we need. And you know what? That number is repeated so many times that we may as well make it a variable. If we ever need to update the number later, then all it takes is changing it once instead of all those individual times. 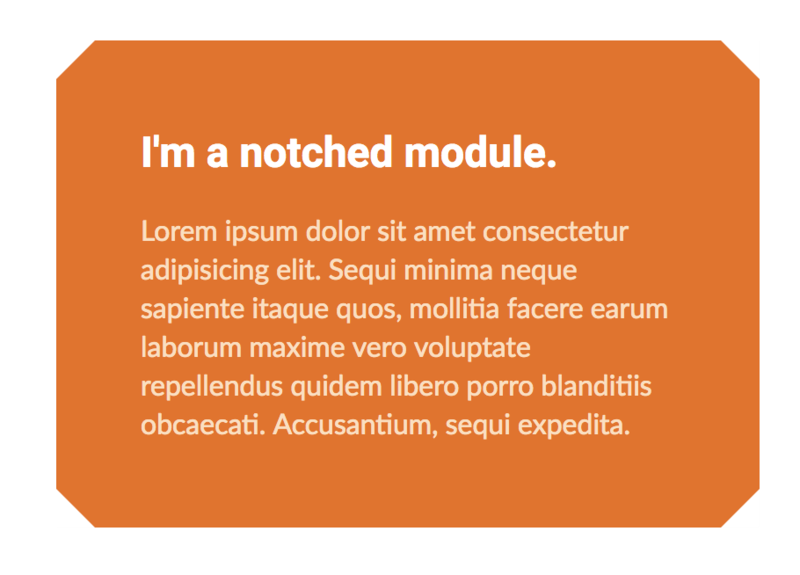 See the Pen Notched Boxes by Chris Coyier (@chriscoyier) on CodePen. This may go without saying, but make sure you have enough padding to handle the clipping. If you wanna get really fancy, you might use CSS variables in your padding value as well, so the more you notch, the more padding there is. So then the corners won’t be notched, right? Oh well. Doesn’t mean don’t do it. 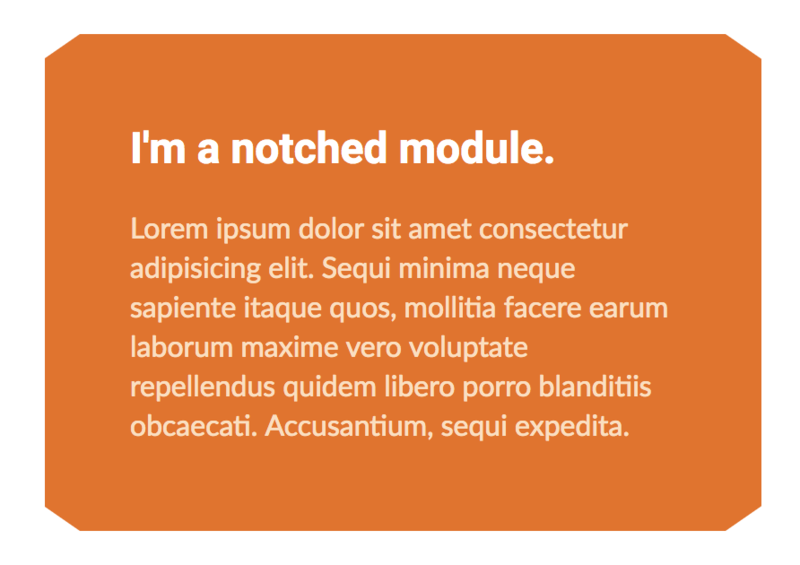 If you know the dimensions of the box or at least its aspect ratio, you can do it with a rotated pseudo-element behind the text content. I’ve used CSS variables to keep the code DRY, but you can go the full Sass route, not use CSS variables and then I believe support should go back all the way to IE9 (haven’t actually tested). Coming back to the present day, if you want to speed up the implementation of features in Edge, please vote them on their Developer Feedback tracker because votes do matter. Here is the page for clip-path. Would anyone add an example using SVG clip-path for a wider browser support? Do you have a way to also use box shadow on this trick? Cause I would use that! I swear I got it working with a filter: drop-shadow() while I was originally testing it, but can’t seem to figure it out now. 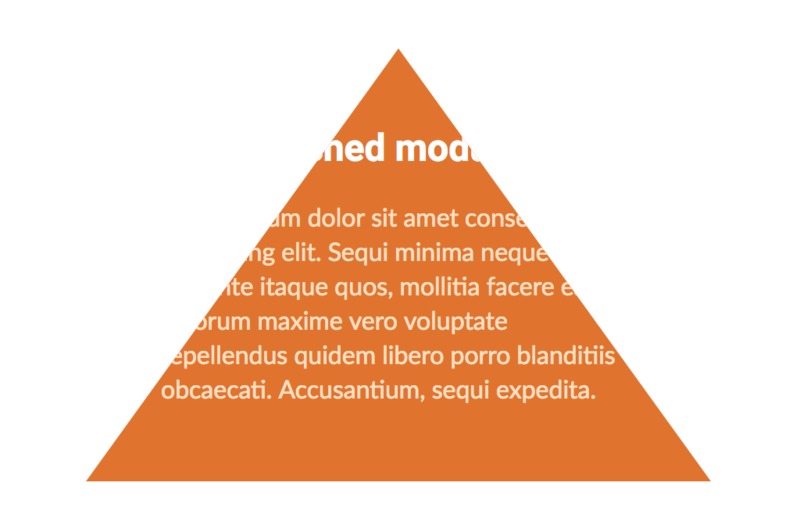 If you really need the shadow, might be worth exploring other possibilities like an absolutely positioned and carefully flexible SVG element placed behind the content. Filters are applied before clip-path, so, in general, the solution is to set the drop-shadow() filter on the parent of the clipped element. In this particular case, I’d set the background and clip-path on an absolutely positioned ::before pseudo that covers the entire box and then apply the filter on the actual box. We are also working on adding this to CSS via a corner-shape property, but implementation interest has been slim. What has happend to Lea Verou’s idea? It has landed in Level 4 of the spec https://drafts.csswg.org/css-backgrounds-4/#corner-shaping but AFAIS there’s no browser supporting this yet. Can I use doesn’t list it yet. I’ve been trying to accomplish this with a transparent background and a border. I might have to stick with some version of an svg! Any ideas? Using clip-path as in this post, you’d have to set a background on an absolutely positioned pseudo-element and cut out the inside part of it using this technique. This way, you’d be left with a “border”. Not a pixel perfect solution though. A great ressources to shape your ideas and have fun with clip-path.